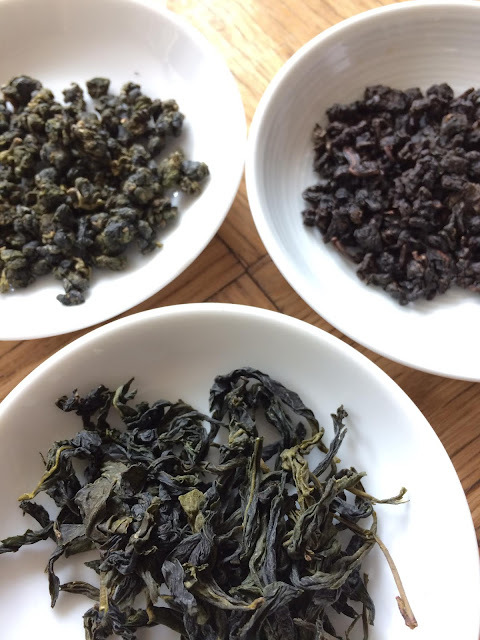 The spring 2018 oolongs from Tillerman Tea are the strip style Wenshan Bao Zhong, the rolled green oolong Cuifeng, and the rolled dark oolong Muzha Tieguanyin. The procession from light to dark and the variation in style made for a tea flight experience. I prepared these Tillerman Tea Spring 2018 oolongs in my professional cupping sets. Each tea was steeped for 3 minutes in 195F water. I used 3 grams of the Cuifeng and Tieguanyin, and 2.5 grams for the Bao Zhong. Second infusions were steeped for 3 minutes 30 seconds in 200F water. An interesting aspect of baozhong is that its appearance resembles Wuyi and Phoenix oolongs in form but not in color because the latter are more oxidized so have darker colored leaves, and of course, different aromas and flavors. 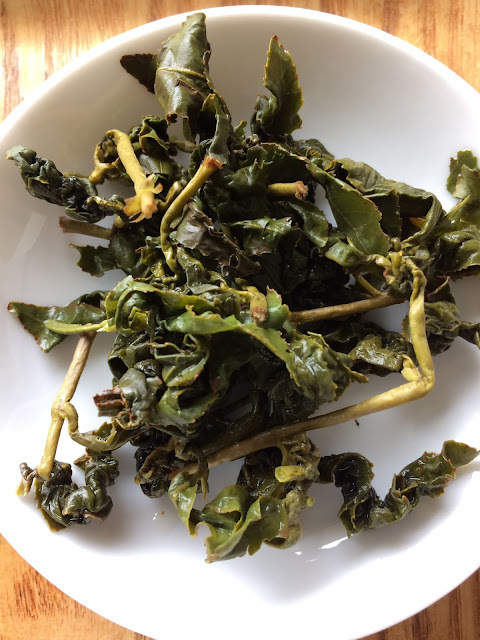 The dry leaves of this Tillerman Wenshan Bao Zhong Spring 2018 by farmer Wong One Dashi smelled like toast and butter. The liquor was spring green in color. The infused leaves smelled of flowers, butter, and vegetables. The liquor was lush and tasted of butter and flowers with a vegetal finish. In the second infusion, the vegetal note dominated with a light floral finish. Teas are classified as high mountain or gaoshan in Taiwan if they are grown above 1,000 meters or 3,281 feet. 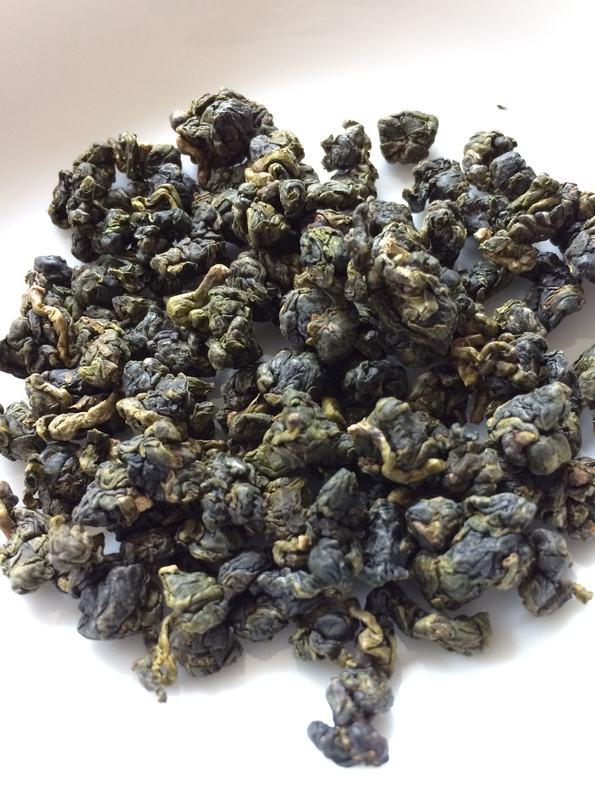 This Cuifeng High Mountain Oolong Spring 2018 was grown and harvested from Lishan Mountain by farmers Chen Feng Yan and Chen Chung Chia. The large, tightly rolled leaves smelled strongly sweet and creamy. The infused leaves smelled herbaceous. The yellow liquor was surprisingly mild. The second infusion was much more flavorful with a medium body liquor. The flavors I tasted were herbaceous and spicy bitterness of almond fruit. I wanted to experience the "rich and viscous [liquor] with a long and persistent finish" so had another session with this tea using Tillerman Tea parameters: 6 grams of tea per 100ml of water at 212F for 20 seconds then 15 seconds, etc. The 15-second infusion brought the oomph! 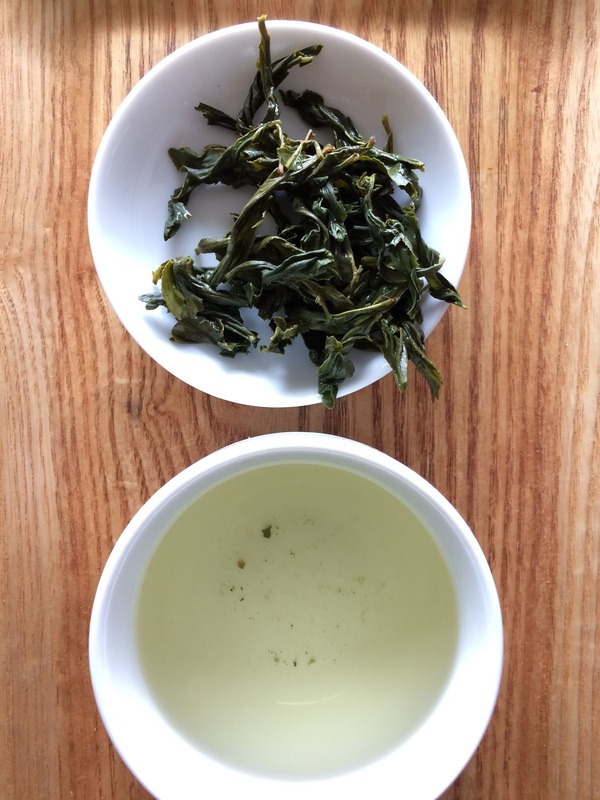 Although the varietal that is used for Muzha Tieguanyin was imported from Anxi, the two styles of Tie Guan Yin look and taste nothing alike. The roast on Muzha Tieguanyin can range from light to heavy. 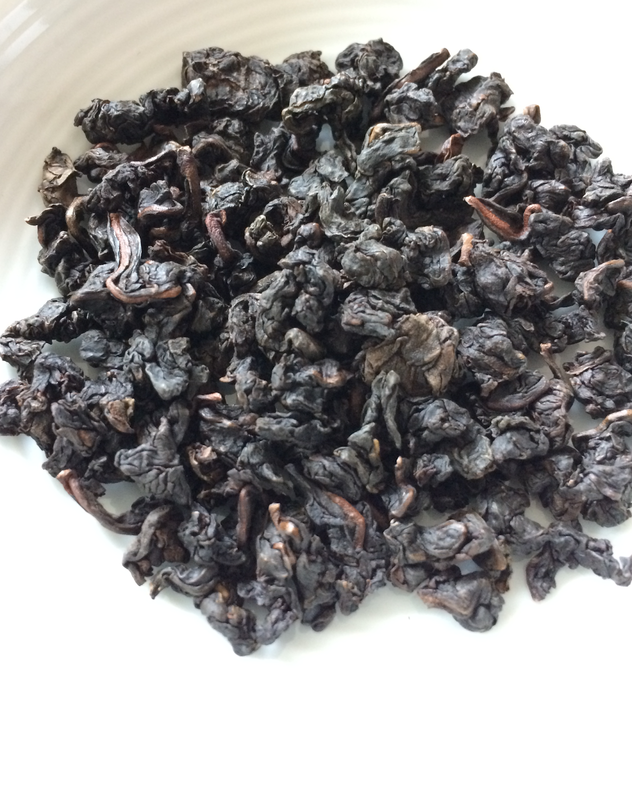 The Tillerman Tea Muzha Tieguanyin Spring 2018 is medium roasted. The leaves, both dry and infused, smelled roasted, sweet, and fruity like dried papaya. The liquor's flavors were consistent with the scent of the leaves. However, it was a light-boded tea. The roast and fruit flavors alternated on my tongue followed by a drying finish. Subsequent infusions were less astringent and quite smooth. My first oolongs I think were Muzha Tieguanyin. Drinking this oolong in particular felt like a bit of a homecoming. I really like the fruit, depth of sweetness, and smooth roast of this style of tea. The buttery and floral aspects of the Wenshan Bao Zhong were also enjoyable and I appreciate that the floral aspect was not overwhelming. The sessions with the Cuifeng provide a caution about tea preparation. If I had only evaluated this tea on my professional cupping session, I would have been disappointed. I gave the tea another try because I have always enjoyed Tillerman Tea oolongs. Using the company's parameters made this gaoshan shine. So tea drinkers, if you can, have a couple of sessions with your teas using different steeping parameters. You might be pleasantly surprised with the results! 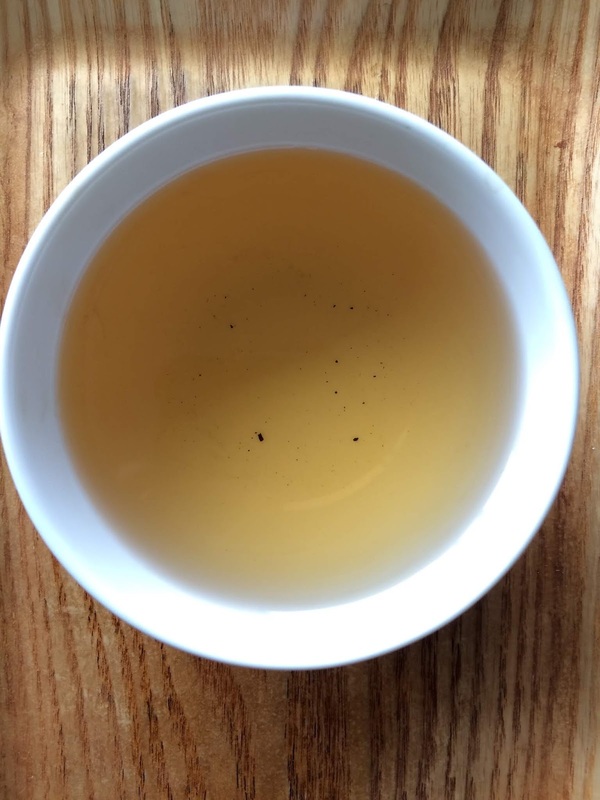 The Spring 2018 Oolongs reviewed here were provided by Tillerman Tea.